Clubmen in the 1880s said their cycling press was out of date. There were more than a dozen magazines then. They wanted a breezily-written magazine and the man who gave it to them was a cycling crack of the day, Edmund Dangerfield, aged 26. His ideas shook the cycling world – and the publishing barons. He was a pioneer of modern journals that pack the newstands today. So we toast young Dangerfield, a rebel spawned from a puritanical Victorian household, who founded a magazine empire. 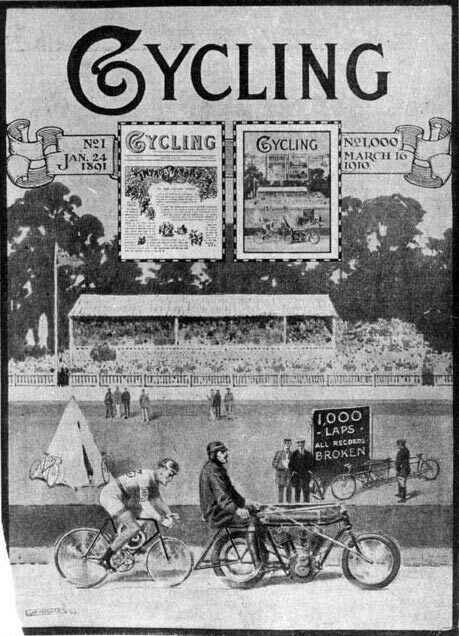 It was January 24, 1891, when Cycling, an illustrated weekly, went on sale priced one penny. It consisted of 20 pages printed on pink paper, with a blue-tinted cover. ‘It was bright, it was readable, it bubbled with enthusiasm and nothing like it had been seen before,’ claimed former editor Arthur C. Armstrong (in his book, Bouverie Street to Bowling Green Lane, 55 years of specialised publishing) in 1946. Dangerfield was born in London in April 1864. He shared his pioneering spirit with another, Alfred Harmsworth, a Dubliner, born one year later. Both Dangerfield and Harmsworth set new standards in popular specialised journals, with Harmsworth setting out on his career with publishers Iliffe and Sons, Coventry, who produced Bicycling News and The Cyclist. Both were ponderous magazines sporting great slabs of type before Harmsworth arrived to reduce revered pundits’ work into snippets in an attempt to liven them up. While Dangerfield’s enterprising new cycling magazine led to the formation of Temple Press and other journals, notably The Motor, Harmsworth’s editorial skills practised on rival cycling papers led him to form the Daily Mail. They were heady times. They were born into a world soon to become liberated by the cycle and the motor car. It was the beginning of a new era for the masses hitherto restricted to travelling as far as their own two legs could carry them. For most people lived and died without moving more than a few miles from their birthplace. Cycling‘s founder, however, had a good start in life. He was one of four brothers running a successful printing company and was ideally placed to introduce a new cycling title. It was something his cycling companions, in particular, the Bath Roaders, had impressed upon him to do, tired as they were of the dozen or so other cycling journals smothered in Victorian dullness. Linked with the evolution of the new journalism came the diamond-frame safety bicycle designed by J.K. Starley, and the pneumatic tyre which smoothed out those rutted roads. They were days of great social change and it led to many a row in many a household, the Dangerfield family being no exception. Winning the great double, the first Bath Road Club ‘100′ in 1890 and one month later the North Road ‘100′, cut no ice with his father. Edmund lived his early days in this suffocating family environment in a large house close to Wandsworth Common. He was a strict Victorian disciplinarian for whom Sunday meant church, not cycling. A tribute to Dangerfield’s inspiration (written by Arthur C. Armstrong, editor in 1893) recreates a few moments in that house. Edmund was the black sheep of the family, while his three brothers and a sister remained firmly under their father’s influence. But one Sunday, for the sake of temporary peace, Edmund had consented not to join his cycling companions at the Angel, at Ditton. He would forsake the chance to test new cycles often brought for riders to try on the eve of a cycle show. Instead, he continued his rebellion on another footing, by occupying the library, there to commit two other sins. Daring to occupy the library on a Sunday was bad enough, but having the temerity to read a newspaper as well was asking for trouble. Perhaps Dangerfield’s home life paralleled that of the outside world which was often just as dull and boring to the growing masses now presented with the means to escape their environment. Dangerfield was urged to start a new cycling journal principally by C. P. Sisley, described as being aflame with enthusiasm. He was secretary of the Catford CC and published a monthly single page sheet – the Record – recording activities of members. Another was C. A. Smith, of the Bath Road Club. At last, throwing caution to the wind, Dangerfield went ahead. He appointed Sisley, 23, as editor and they were joined by Walter Groves, 24, secretary of the Polytechnic CC. So it was that this young team entertained the cycling world, producing Cycling on a ramshackle Beam engine printing press which used to rock the premises at 17 1/2 Bouverie Street, while the editorial team rented cramped rooms at number 27. From a single weekly in 1891, Temple Press, as it became known, grew to over a dozen journals representative of virtually every field in the evolution of the means of travel effected first by the bicycle and later the internal combustion engine. Little did Dangerfield know then that his cycling venture would grow, together with the publishing enterprise which became Temple Press, to become part of IPC, one of the largest publishing corporations in the world.